The Albuquerque Journal is the largest newspaper in the U.S. state of New Mexico. The Golden Gate newspaper was founded in June of 1880. In the fall of 1880, the owner of the Golden Gate died and Journal Publishing Company was created. Journal Publishing changed the paper name to Albuquerque Daily Journal and issued its first edition of the Albuquerque Daily Journal on October 14, 1880. The Daily Journal was first published in Old Town Albuquerque, but in 1882 the publication moved to a single room in the so-called new town (or expanded Albuquerque) at Second and Silver streets near the railroad tracks. It was published on a single sheet of newsprint, folded to make four pages. Those pages were divided into five columns with small headlines. Advertising appeared on the front page. The Daily Journal was published in the evening until the first Territorial Fair opened in October 1881. On October 4 of that year, a morning Journal was published in order to record the day’s events at the fair. The morning Daily Journal continued for six issues. The last issue was published on Sunday, October 9 – making it the first Sunday newspaper to appear in Albuquerque. In 1887, the Morning Journal was absorbed by the Albuquerque Daily Democrat, a newspaper founded in Santa Fe which had moved to Albuquerque. The newspaper’s name changed in 1899 to the Albuquerque Journal-Democrat. A change in policy necessitated the dropping of "Democrat" from the paper’s name in 1903, so the digest appeared again as the Albuquerque Morning Journal. The daily paper name was changed to the Albuquerque Journal in 1925 when an independent editorial policy was established. The Albuquerque Journal is published Monday through Saturday with a Sunday edition called the Sunday Journal. In addition to the Journal’s daily final edition, Journal Publishing, also, issues regional newspapers. These include the Journal North, the Rio Rancho Observer and Valencia County News-Bulletin. Newspaper sections include news, advertising, comics, Business; Sports, Metro & N.M., Health, Education, Food, Go, Fetch, VENUE (entertainment tabloid on Fridays), Drive (auto tabloid on Fridays), TVNow (TV book on Saturdays), and HomeStyle. Journal Publishing, also, issues quarterly magazines within the Albuquerque Journal which are - Sage, Fit and Live Well - as well as a variety of special sections throughout the year. Sections of The Sunday Journal include: Living, Arts, Books, Travel, Careers;, Real Estate, Money, Dimension, and Wall Street Journal business. Journal Publishing has an online-digital edition of the daily Albuquerque Journal optimized for mobile viewing, also. ^ "eCirc for US Newspapers". ACCESS ABC. 2009-09-30. Archived from the original on 2013-03-17. Retrieved 2011-03-09. 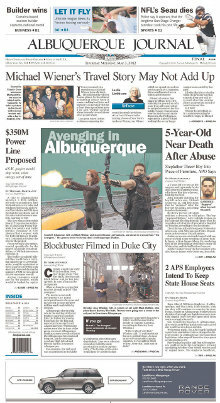 ^ "Albuquerque Journal: History". Albuquerque Journal. Retrieved 2017-09-10.